The Electric Propulsion Innovation & Competitiveness (EPIC) project aims to provide a clear integrated roadmap of activities and a master plan for upcoming calls in that field, which will then be implemented through a Strategic Research Cluster (SRC). The objective is to increase the Technology Readiness Level (TRL – as per ISO 16290 standard) of future EP technologies. Incremental technologies line are those considered mature enough at the moment to allow for incremental steps to enable capabilities such as dual mode, higher/lower power, Electric Orbit Raising (EOR), required by a number of applications such as telecommunications, LEO / MEO missions, space science and exploration, space transportation which the current systems (some of them qualified and some with flight heritage) are not able to provide. A detailed description of the above lines is included in the corresponding guidelines. A ‘disruptive space technology’ is an emerging technology that disrupts the status quo of the space sector by replacing the dominant technology and provides a radical improvement in performance that is perceived as valuable by a customer or part of the market, or it opens up new opportunities not possible with the incumbent technology. If a disruptive technology can be identified early enough, accelerating the development of that technology would help sustain advances in performance. Emerging technologies that are potentially ‘disruptive’ often underperform compared to the dominant technology in early development phases – the underlying physics may not be fully understood for example and more R&D is required to properly ascertain performance attributes. This topic focuses on promoting promising and potentially disruptive concepts in the field of Electric Propulsion, in order to allow the increase of the currently low or very low TRL of breakthrough concepts which in the long term could change the EP landscape. breakthrough concepts which in the long term could change the EP landscape. A detailed description of the above line is included in the corresponding guidelines. 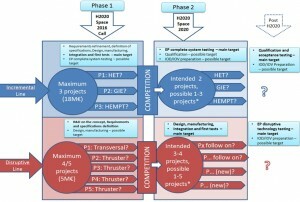 Phase 1 = H2020 Space Work Programme 2016 and the SRC OPs funded through the COMPET-3-2016 call topic. Phase 2 = Future H2020 Space Work Programme (2019/2020) and the SRC OPs funded through future call topics. The following figure provides an overview of the high-level SRC Roadmap evolution. In Phase 1, the basis is laid for achieving the final aim of the SRC “In-Space Electrical propulsion”: European technical leadership and economic competitiveness on Electric Propulsion at world level. To that extend, the most promising technologies shall be supported and enabled to reach higher levels of maturity, while proving their suitability for mid to long term identified or new applications needs. 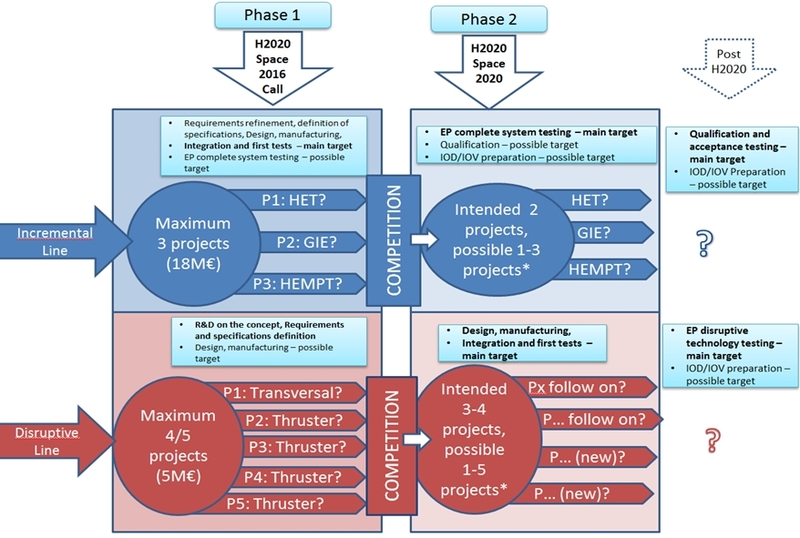 2016 Call is focus on the challenge of enabling major advances in Electric Propulsion for in-space operations and transportation, in order to contribute to guarantee the leadership through competitiveness and non-dependence of European capabilities in electric propulsion at world level within the 2020-2030 timeframe, always in coherence with the existing and planned developments at national, commercial and ESA level. Phase 2 foresees the continuation of the two lines of developments (incremental and disruptive technologies). Aspects as the number of projects, continuation or establishment of new projects, expected funding, etc. will remain open until the future Work Programmes are adopted, etc. The objective for this phase is to support the more promising technologies developed in Phase 1 towards the higher TRLs, in order to, at the end of the Phase 2 projects, to achieve the SRC expectations and, potentially, be ready to prepare the chosen EP system(s) for a potential IOD/IOV. For further information on this topic see the COMPET-3-2016 call text and its corresponding guidelines in our Related Links section.